An 18-month-old male child weighing 9 kg with oxygen saturations of 78% was diagnosed to have heterotaxy, left isomerism, dextrocardia, right azygos continuation of the inferior vena cava, common atrioventricular valve, single ventricle, and pulmonary atresia. 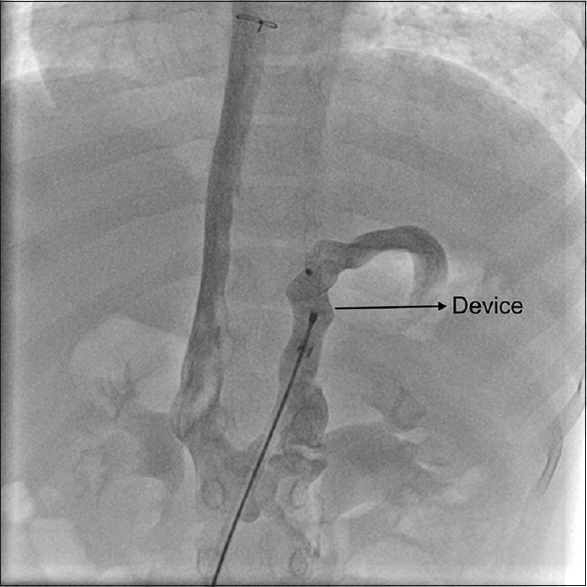 Cardiac catheterization demonstrated a communication from the renal portion of inferior vena cava to the final common splenic vein arising from multiple splenunculi [Figure 1] and [Video 1]. The pulmonary artery pressures were recorded to be 15 mmHg through an end-hole catheter through the ductus arteriosus. There were no secondary effects attributable to this Abernathy malformation, and hence, it was not closed. He underwent total cavopulmonary (Kawashima) shunt uneventfully. After 2 years, he developed increasing cyanosis and worsening hypoxia. Cardiac catheterization showed elevated pulmonary artery pressures of 20 mmHg with flow reversal through the Abernathy vein. 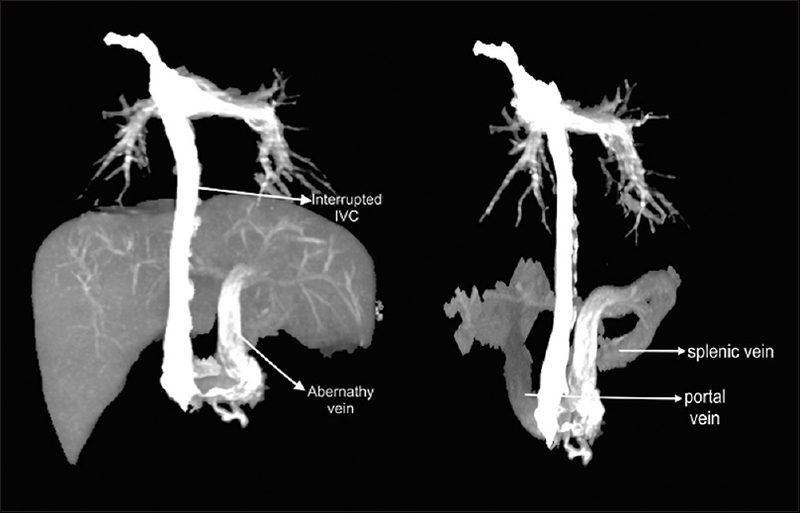 There were no other new venovenous collaterals or pulmonary arteriovenous malformations. Oral sildenafil was given for 1 year to reduce the pulmonary artery pressures. Computed tomogram showed the vessel diameter to be 10 mm [Figure 2] and [Video 2]. Closure of the Abernathy collateral with 12–10 HeartR duct occluder (Lifetech Scientific, Shenzhen, PRC) through a femoral venous long sheath resulted in improvement of oxygen saturations to 92% without further increase of pulmonary artery pressures [Figure 3] and [Video 3]. Hemodynamic study after 18 months showed reduction of pulmonary artery pressures to 15 mmHg. Single ventricle after total cavopulmonary (Kawashima) shunt in the presence of Abernathy malformations poses a peculiar hemodynamics [Figure 4]. In a normal circulation, the usual transpulmonary gradient from pulmonary arteries to left atrium is 5–6 mmHg, and the usual gradient from portal vein to the hepatic veins across the liver parenchyma is 1–2 mmHg. When inferior vena cava is connected to pulmonary artery, the Abernathy vein acts as a decompressing collateral and the higher transpulmonary gradient usually tends to drive blood toward the portal circulation and cause hypoxia. However, any flow reversal, even if occurring for brief periods, results in unmetabolized toxic substances in the postprandial state from the mesenteric circulation to enter the pulmonary circulation, leading to either increase in pulmonary vascular resistance or creation of arteriovenous malformations. The rise in pulmonary artery pressures and fall in oxygen levels in our patient were secondary to this peculiar physiology. 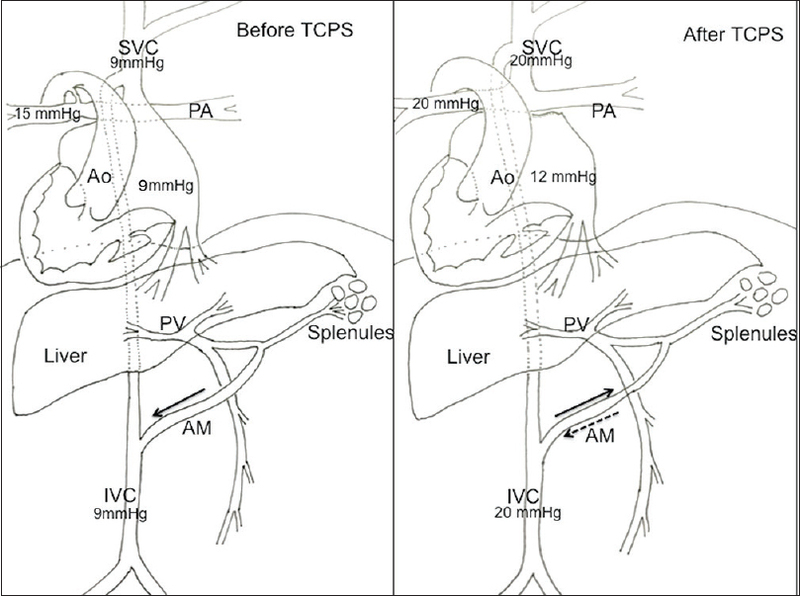 Percutaneous closure of Abernathy malformation led to immediate reduction of the bypass of caval blood to the portal circulation and resulted in improved oxygen levels. As the intestinal unmetabolized products could no longer reach the lung bed, the high pulmonary artery pressures also normalized. Even though portal vein pressures could be assessed by wedging an end-hole catheter in the hepatic veins, it was not done in our patient. He continues to have oxygen saturations of 90%, 2 years following the closure of Abernathy vein. He will be planned for completion of Fontan surgery by routing the hepatic veins to the pulmonary artery through an extracardiac conduit in future if there is a fall in his oxygen saturations. Morgan G, Superina R. Congenital absence of the portal vein: Two cases and a proposed classification system for portasystemic vascular anomalies. J Pediatr Surg 1994;29:1239-41. Massin M, Verloes A, Jamblin P. Cardiac anomalies associated with congenital absence of the portal vein. Cardiol Young 1999;9:522-5. Kothari SS. Non-cardiac issues in patients with heterotaxy syndrome. Ann Pediatr Cardiol 2014;7:187-92. Ratnasamy C, Kurbegov A, Swaminathan S. Cardiac anomalies in the setting of the Abernethy malformation of the portal vein. Cardiol Young 2007;17:212-4. McElhinney DB, Marx GR, Newburger JW. Congenital portosystemic venous connections and other abdominal venous abnormalities in patients with polysplenia and functionally univentricular heart disease: A case series and literature review. Congenit Heart Dis 2011;6:28-40.